'House' has long been synonymous with 'home': the significance of four walls and a roof lies far deeper than simply shelter from the elements. A house stands for sanctuary, family, belonging, privacy and our pasts: even when standardised as a 'Barratt Home' or modern housing estate, every house bears the stamp of the people who live in it, remaining a bastion of quirky individualism. 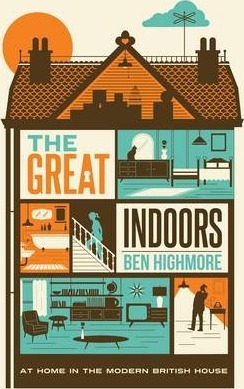 The Great Indoors is the first cultural history of the family home in the twentieth century, comparable to Rachel Hewitt's Map of a Nation or Joe Moran's Queuing for Beginnners. As society has changed, so has the house: the hall - which had its finest hour during the middle ages, when families and their servants ate, slept and socialised there together - has now been relegated to a mere passageway, only useful for getting to other (more private) rooms. Highmore shows how houses display the currents of class, identity and social transformation that are displayed in the arrangement and use of the family home. And he also offers an engaging and stimulating peek through the curtains to explain why the fridge is used as a communication centre, how the loo (or toilet) inspired its very own literary genre and what your furniture arrangement reveals about how you function as a family.